Splash pages, you gotta' love 'em. A blank canvas where the artist can take the break off their pencils and hit the reader square in the face with a large does of illustrated 'wow'. 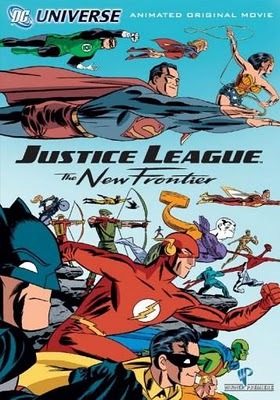 This week the second of the fortnightly spreads from the jaw-dropping DC: The New Frontier - written and illustrated by Darwyn Cooke (Click to enlarge). 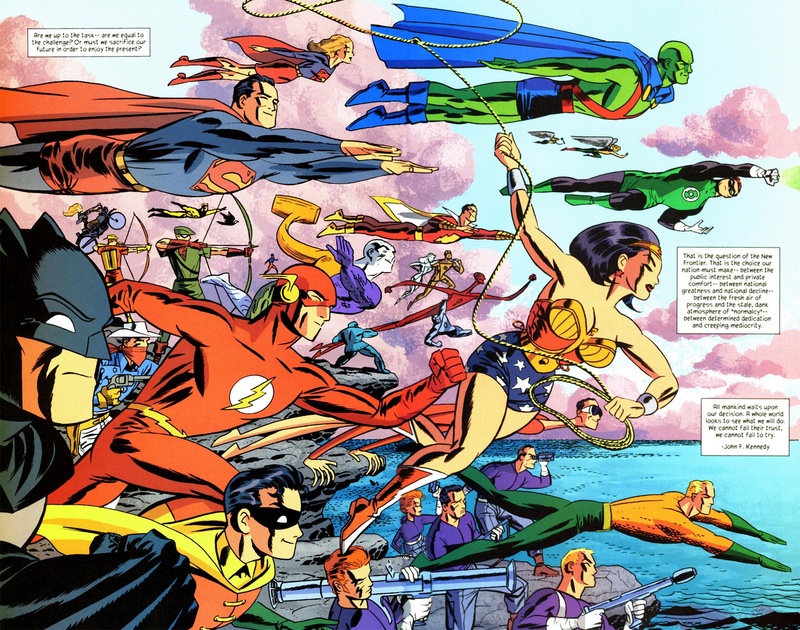 Nothing says 'hero' like racing into the sunset, and when your racing with everyone from The Challengers of the Unknown to Martian Manhunter, few things say DCU as well either. No wonder this image made cover to the animated DVD adaptation (with a little character reshuffling here and there) it's just one of those shots that could sell just about anything. that is quite an impressive art work spread and it looks good on this blog. and it's this splash page that got my attention of the DVD when i saw it at a library a couple of months ago so i checked it out. however after having watched it i would have to say that the splash page was the high point of having had this DVD for a little while. needless to say i returned it to the library several days before the due date. Thanks for the comments David! I think it's a pretty sweet spread too. Nice to see all the next row back folk dropping into the group shot too. I made the mistake of rushing out and buying the dvd when it was first released. Not a horrible watch, but I don't think the kids have asked to watch it again since. I agree David, the cover was the best thing about this DVD. thank you for the validation Cderosby i'm sorry you didn't find that DVD in the library as well. FYI i've got some more postings up since your first visit to the new Suicide Squad site. Dan, i take it "hort" means like scant or too brief? thanks again for that MTV/Brooks article. if you haven't seen it yet you'll love the photoshop image i produced to go along with the article. that MTV commercial music will start to go off in you head when you see it. Sorry hort isn't kiwi slang - it was an unfixed typo - damn them all! I think where the DVD struggled was it was a short space of time compared to the books, to tell the tales of four main plotlines. Green Lantern and the Martian Manhunter tie into the space race which is the key aspect of that whole era, and Superman's plight is the heart of the story from the superheroes side, but I think if the DVD had just focussed on those and left Flash's tale as a treat for those who made it to the comic store, then everything would've had just that much more room. Still that said, that scene with Batman and Martian Manhunter - flawless.